12:46 p.m. – Some bad buzz at the Spirits after party. “What happened to Shutters,” a prominent filmmaker asked tonight at the bash, referring to the annual IFC post-Spirits party that was a popular spot after the ceremony. The director was bummed to miss the mixing with industry insiders at the soirée now that the show and party are downtown. Some folks danced tonight, while others snacked on sweets. But, the angrier set were bothered when the bar closed without warning at 12:45 p.m. A few minutes later, more dancers moved to the dance floor to try to get the DJ to play just one more song. No luck. The lights went up on the bash at 12:59 p.m. and die hards began talking about an after after party atop a nearby hotel. 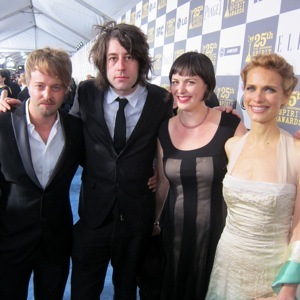 10:50 p.m. – The full list of winners are here at indieWIRE as we make our way over to the after party down the street. 9:29 p.m. “I’m a high school dropout,” proclaimed Dave Grohl, introducing rock band Anvil. The crowd inside the tent seem to be mostly ltaking the hard driving Anvil tune in stride. A few are clapping along, many others seem a bit puzzled. At least everyone is awake now as we head into the final half hour of the ceremony. Attendees have been drinking for about 4 hours, so far, with another 4 to go before the night officially wraps up. 9:15 p.m. – A rousing standing ovation for Roger Ebert, sponsor of the Truer Than Fiction prize with his wife Chaz. 9:10 p.m – “I don’t really know what to say being in front of all of you I’ve admired all these years,” said Kyle Patrick Alvarez, accepting his trophy on stage. She also vouches for Kathryn Bigelow come Sunday night. 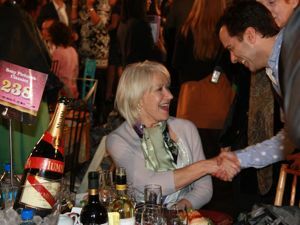 Helen Mirren at the Spirit Awards. Photo by Brian Brooks. 8:37 p.m. – “Precious” gets it’s second prize with the best supporting actress honor for Mo’Nique. She kept it pretty serious. “Wow,” Mo’Nique said, then singling out Lee Daniels. 8:32 p.m. – Jeff Bridges wraps his on stage performance with a song from “Crazy Heart,” a good time to pop into the upgraded porta potty just outside the tent. As I’m leaving, who do I run into but Jeff Bridges himself. 8:25 p.m. – It’s all about the MySpace tonight (as our commenter already pointed out… does MySpace still exist? 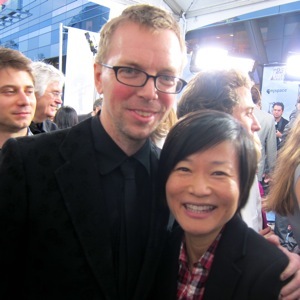 ), and people on the social networking site were polled as to what their favorite moments from past Spirit Awards were. We’re getting the winners throughout the night. 8:21 p.m. – “He made it all possible,” Robert Duvall said on stage alongside Scott Cooper, winner of the Best First Feature prize, “He never directed a high school play before..
Harrelson praised John Cassevetes as the father of independent film, saluting indie filmmaking. 8:07 p.m. – Rosario Dawson and Colin Farrell present the first award: best supporting male. The first winner of the night is… Woody Harrelson! 7:56 p.m. – You know the show’s about to start when you start spotting the big names. Elton John is sitting at the Sundance Channel table, I think alongside channel exec Christian Vesper. 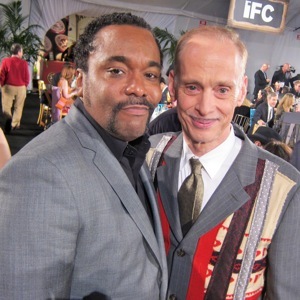 Walking around near the stage I ran into Lee Daniels, he gave John Waters a massive embrace. They hugged and chatted and posed for a quick photo that we’ll post later. And then Monique made a grand entrance. “Is that the ‘Precious’ zone!” asked Roger Friedman from The Hollywood Reporter. Yup. “Mariah is in the house!” screamed a FIND staffer moments later. 7:52 p.m.: Overheard outside the press tent (where I will be bringing you comments for the rest of the night, both Eugene Hernandez and Brian Brooks will be in the main tent) as I smoked one last pre-ceremony (eight minutes and counting) was Pierce Brosnan saying to his wife: “People keep asking me about the beach. I never went to the one at the beach. They never invited me to the beach.” [Peter Knegt]. 7:36 p.m.: Mariah Carey, in one her final legitimate appearances at a film awards ceremony, is asked a random question out of a box (care of Spirit Award fans on Myspace!) on the blue carpet. “Crazy Heart” director Scott Cooper and his wife on the blue carpet. Photo by Brian Brooks. 7:20 p.m.: All-but-assured-winner Mo’Nique has arrived on the blue carpet, and is asked what advice she’d give to someone that looks up to her as a role model. 6:46 p.m. – Everyone is talking about the new venue, on the top floor of a giant downtown parking structure in Los Angeles. 6:32 p.m. – The blue carpet is a bit of a free-for-all. A long row of interviewers and photographer line the sidewalk downstairs from the tent where the show will take place. The number of bystanders and fans seems to be smaller than past shows on the beach in Santa Monica. 6:25 p.m. – The endlessly charming Gabourey Sidibe has hit the blue carpet, being told by reporters that she has been the most consistently pleasant presence this awards season. “Wait until the Oscars are over… I’ll show up drunk everywhere,” Sidibe deadpanned back. Olympic figure skater Johnny Weir on the blue carpet. Photo by Brian Brooks. 5:45 p.m. – On the blue carpet chatting chatting with arriving filmmaker’s and celebs. Jameson cocktails are being served as folks arrive, before they hit the press line, just to spice things up a bit. Just ran into “Crazy Heart” director Scott Cooper, he seems just thrilled. 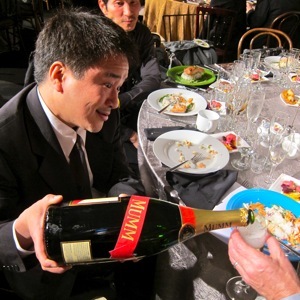 5:01 p.m. – It’s happy hour in Los Angeles where the Independent Spirit Awards have moved downtown for their 25th Anniversary. The show is taking place on a Friday evening ahead of this weekend’s Academy Awards, a big change from recent years when the ceremony was held on the beach in Santa Monica on the Saturday afternoon before the Oscars.